After the economic meltdown of 2008, Warren Buffett famously warned, 'beware of geeks bearing formulas.' But as James Weatherall demonstrates, not all geeks are created equal. While many of the mathematicians and software engineers on Wall Street failed when their abstractions turned ugly in practice, a special breed of physicists has a much deeper history of revolutionizing finance. Taking us from fin-de-siecle Paris to Rat Pack-era Las Vegas, from wartime government labs to Yippie communes on the Pacific coast, Weatherall shows how physicists successfully brought their science to bear on some of the thorniest problems in economics, from options pricing to bubbles. The crisis was partly a failure of mathematical modeling. But even more, it was a failure of some very sophisticated financial institutions to think like physicists. Models-whether in science or finance-have limitations; they break down under certain conditions. And in 2008, sophisticated models fell into the hands of people who didn't understand their purpose, and didn't care. It was a catastrophic misuse of science. The solution, however, is not to give up on models; it's to make them better. Weatherall reveals the people and ideas on the cusp of a new era in finance. We see a geophysicist use a model designed for earthquakes to predict a massive stock market crash. We discover a physicist-run hedge fund that earned 2,478.6% over the course of the 1990s. And we see how an obscure idea from quantum theory might soon be used to create a far more accurate Consumer Price Index. 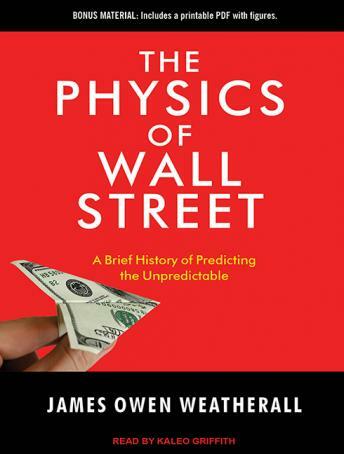 Both persuasive and accessible, The Physics of Wall Street is riveting history that will change how we think about our economic future.